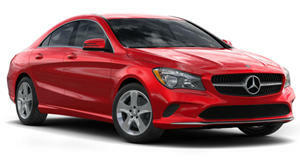 This ought to do the trick at least until the new CLA45 arrives. Choices. Mercedes likes to give you choices. And that extends to its performance division, which has just rolled out another new model that's not only among its most stylish, but promises to be one of its most accessible, too. 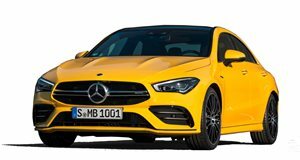 Following the reveal of , AMG has slotted the same powertrain into the svelter four-door coupe to launch the new 2020 Mercedes-AMG CLA35. Bridging the gap between the base and the next , the newest member of the AMG family packs a 2.0-liter turbo four good for 302 horsepower and 295 lb-ft of torque. Driven to all four wheels through a seven-speed dual-clutch transmission, the muscle's estimated to propel the CLA35 to 60 mph in 4.6 seconds – its streamlined form helping to shave a tenth off the A35's sprint. And while that may not be as quick as the 4.1 seconds claimed by the outgoing CLA45, it's a heck of a lot quicker than the 6.3 seconds it takes the CLA250 to reach 62. 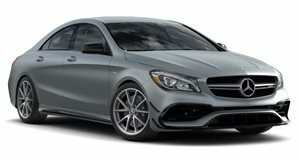 Along with the upgraded powertrain, the new AMG CLA35 also features a reinforced body shell, performance-tuned suspension, adaptive dampers, variable exhaust, a recalibrated, speed-sensitive electro-mechanical steering rack, and beefier brakes. Four-pot calipers grip 13.8-inch rotors at the front, and single pistons grab 13-inch discs at the back to haul the augmented four-door back from the pace of which it's capable. They're housed within standard 18-inch (or optional 19-inch) alloys within widened wheel arches to complement an array of visual enhancements applied by the folks in Affalterbach. The hood, for starters, features a pair of power domes. The horizontally split grille is unique to the AMG model, capping a restyled front bumper, with a diffuser element in the rear bumper flanked by dual round tailpipes and topped by a small trunklid spoiler. The cabin's been upgraded for the performance model as well, with a beefier flat-bottomed steering wheel, galvanized shift paddles, red-stitched upholstery, a variable digital instrument display, and an MBUX infotainment system with Track Pace telemetry function. Drivers will be able to switch between five dynamic modes and even switch off the ESP completely. Pricing has yet to be announced, but AMG's latest is set to each US dealers later this year, following its debut this month at the New York Auto Show.